I recently wrote about how the role of scores in video games has evolved - from the entire purpose of early arcade games to a vestigial organ in the nineties to a competitive bonus in the late aughts. Along the way something called "achievements" cropped up, which I consider both a marketing marvel and a social curse. Achievements are merit badges that add up to a combined score across multiple games. With the Xbox 360 console, each achievement has a number value that adds to you what's called a player's Gamerscore. 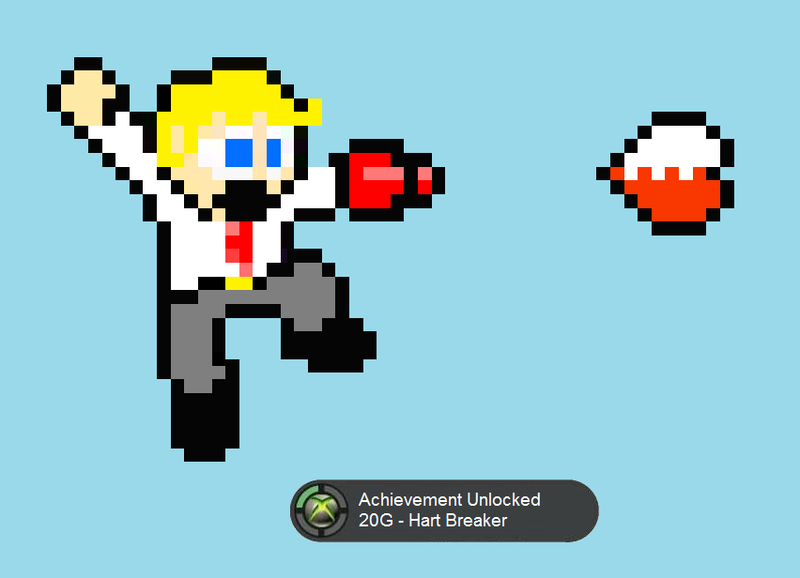 Achievements are awarded automatically for beating in-game challenges, such as finishing a level, or beating a specific boss without taking any damage. Tougher achievements give more points to a player's Gamerscore. A player's Gamerscore is displayed online, and interested parties can comb through and see exactly what achievements make up a player's score. The Xbox's console rival Playstation 3 uses a similar system, where players are given "trophies" for beating challenges. However, there are no numbers associated with the trophies. Players have a list of gold, silver and bronze trophies they have unlocked while playing. The achievement score does not earn the player anything tangible, like free games or bonus levels. It is purely aesthetic. On the surface, achievements sound like they should be a minor footnote in modern video game trends. Indeed, most new players ignore them. After all, it's just a list of what you've done during a recreational activity. The only person who really cares about a Gamerscore is the actual player. Achievements shouldn't matter very much. But in practice, achievements are a big deal. Achievements encourage people to replay a game using a challenging limitation, such as "The One Free Bullet" for beating Half Life 2: Episode 1 with only firing a single bullet. There's a very positive effect for players simply by putting optional challenges within a game. It's fun to complete these challenges, and it gives games a higher replay value. But the quest for achievements often overshadows gameplay and for some, becomes more important than actually having fun. The Internet if filled with pages and videos to show players how to unlock difficult achievements. Games are criticized for having achievements that are too challenging. Video game review sites contain a lot of recommendations of games to play just for some quick achievements. Achievements also encourage people to sabotage multiplayer games by selfishly ignoring team objectives to work on achievements. Players will plug away at mediocre advergames like Doritos Dash of Destruction - or as the game itself put it, "go on a Gamerscore rampage" - just to get more Gamerscore points. The Doritos company got players to spend a good chunk of time in a world stamped with their logo not by offering them a fun game, but by rewarding them for playing with "points" that cost the company nothing. I'd like to say I'm immune from the achievement siren song, but I've caught myself caring more than I should. A few years ago I was trying to decide between buying Bioshock for my computer or Xbox, and the idea that I won't get achievements with the computer version encouraged me to go with the console version. In the past few months I realized one of things that's keeping me from playing some of my old Playstation 2 games that I never finished is that there won't be any achievements to mark the accomplishment. In both cases, I was more likely to use my Xbox 360 console than another gaming system because of achievements. That's a pretty powerful business advantage Microsoft introduced. Remember, these are just merit badges. They only cost a trivial amount of the programming effort, but they have a big impact people's desire to play video games. Even games the players don't actually enjoy. So what impact has the player reactions had on achievements themselves? I don't have a shred of hard evidence to support this, but my experience tells me that games are experiencing an achievement creep - that players expect to unlock achievements as they play a game, so game makers are making achievements easier. A game with difficult achievements won't sell as many copies. The perfect example is the "Off The Boat" Achievement in Grand Theft Auto IV, where you get an achievement within the first five minutes of the game for driving a car down several blocks of quiet streets. The entire point of achievements should be beating challenges, not rewarding people for completing easy levels. I've played a few downloadable game demos that informed me I've just unlocked an achievement, but I have to buy the full game if I want to get credit for it. That's a case of achievement-based marketing if I ever saw one. Unlocking achievements is a guilty pleasure for me, a clever marketing scheme for game companies and a soulless, misguided goal for a large chunk of players. I like having them to add a little spice to games, but I loathe the culture they've spawned. While individual achievements can be good indicators of skill, a player's gross Gamerscore tells you nothing. It is not like a Donkey Kong high score. It's simply a reflection of how many games a player has access to and how much time they're willing to work on an arbitrary goal. One of my first stories when I became a newspaper reporter was on a small-town zoning battle. A local businessman bought some land for a rock quarry and the people who lived around it wanted it stopped. The quarry would bring rock blasting and dump trucks to their neighborhood, so they slowed down the approval process at the town council meetings. This went on for about a year. I started writing about it a few months after it started, and eventually I got phone call from the leader of the neighbor group. She told me that her side was not getting enough attention in my reports, and that I was missing some elements of the story, so therefore no one from her group is willing to talk to me anymore. I waited a few seconds, and asked, "So what you're saying is, your view isn't in the paper as much as you'd like, so your solution is to stop me from interviewing you? As foolish as that sounds, that's exactly how skeptics treat the mainstream media. The mainstream media is awash with woo stories and skeptical sources are rarely included, so the public gets an unbalanced view on reality. The popular view of skeptics is that the media are too lazy to get all of the facts right and journalists care more about presenting an attention-getting story than a factual one. While these explanations can be true, they are painfully incomplete. Skeptics do not understand how news stories are generated, overestimate the resources news teams work with and misunderstand what motivates reporters. I will tell you how the news really works, how skeptics are using the wrong tactics to influence the media and what we can actually do to have our views included. How are news stories written? Back to the story about the citizens group leader. She criticized me for never using the official name of her neighborhood group; the preservation committee. I said I wasn't aware they had an official name and it had never come up. She said, "Don't you have files on this stuff?" No, news teams don't. We have our own internal archive of back issues that we occasionally review, but most stories are written using interviews, the Internet, documents collected on the story and whatever information the editor feels like sharing. A lot of media criticism comes from treating reporters as experts who should know better. But reporters are not experts. Instead of relying on their own knowledge of a topic, a reporter gathers information and presents it. In a sense, you can think of a news story as a collection of arguments from authority. Facts are facts because the speaker is an expert. In a sense, a news report is more like a Wikipedia article than an Encyclopedia Britannica article. Britannica articles are planned and written by an expert, while Wikipedia articles emerge through the knowledge of a large group of people. "Original research" is discouraged. The reporter acts more like a moderator than an author. Why are skeptics rarely used as sources? There are a couple of biases working against skeptics that keeps us out of new stories. One is that skepticism is reactive. Someone has to present woo before we have a chance to knock it down. It's very easy for a reporter to stumble upon a magic healer or a snake oil salesman. These people advertise and generate a lot of attention. They're visible. But skeptics are invisible. We may have thriving Internet community and blog culture, but the average reporter doesn't know to seek us out when they come across woo. Try thinking of a reporter as someones grandparent. If the subject of a story appears able to perform some supernatural feat, why on earth should we expect the reporter to seek out a magician, a neurologist or an astronomer to comment? And from my own experience, it can be pretty hard to find a skeptic to comment. Local sources are preferred for local news stories, and it's difficult to find local skeptics. Reporters are biased to sources that they can get a hold of on short notice. One criticism I often hear is that reporters care more about making a story exciting than they do about having the facts right. We're accused of sensationalizing to get more readers at the expense of our accountability. I have never once heard someone in the media say they sensationalize. What we say is that we want to find an interesting angle in the story to keep the reader interested. In every media office I've worked in, there has not been a single person who said they'd be willing to get a few details wrong in order to make the story more exciting. Not once. The priority has always been on getting the facts out there, arranged in a way that won't bore the reader. Why would we do this? It's not to make more money. The average reporter won't see a single extra dime as a result of a popular story. Editors either. People don't become reporters just to make money because the job pays too poorly. They care a lot more about presenting information to the world. It doesn't make any sense for someone to choose a career for fulfillment, and then compromise their integrity for zero profit. There's a very simple hoax that pranksters like to play on the media. They make up a phony presentation, report, and website and send out press releases. The story gets picked, but then the pranksters reveal they faked it all. They'll do things like embed "this is all a hoax" in the middle of a long report for extra laughs. Obviously, news teams that run these stories look like fools. They certainly should be scolded for falling for these pranks. But is the media vulnerable because reporters are too lazy to check all their facts? You could certainly make that case a few decades ago, but with all of the media downsizing in the world today, most reporters are too busy to do a thorough job. Most reporters I know turn in at least six stories a week. Why would busy reporters read through a long report when they can just check the introduction and conclusion and the group any questions they have. Again, we should treat reporters as moderators, not experts. Broadcast news has more mistakes than print, but that could be because broadcasters have tighter deadlines. They often have to complete stories the same day they happened, while print has the luxury of overnight production. We skeptics want to be sources in the media, but we haven't made a real effort to get the media's attention. We assume the media knows we exist, what subjects we cover and how to get a hold of us. When we do try to contact the media, it's in the form of a letter to the editor. But we don't want skepticism on the letters page. We want to be in the news stories themselves. Since reporters do not automatically think of skeptic groups when a woo story comes up, it's up to us to get their attention. This needs to take the form of public relations. For our purposes here, public relations is informing the news about things they would want to cover. We need to let the media know that we exist, what subjects we cover and how they can reach us quickly. We can do this before a relevant story breaks, as it happens, and quickly after it happens. Before a story breaks, we can contact the media through in-person visits, phone calls and brief faxes telling them what we do, and suggesting stories like chelation therapy and tax money going to woo businesses. Skeptics who are experts should fax news organizations a concise blog article monthly to position themselves as a future source. The moment a skepticism story breaks, we can contact the media as a potential source to offer a contrasting view, or to explain it in a way viewers will understand. Phone calls or faxes work best. This is very difficult to time, so we should not expect many opportunities to help. If a story is already out there, contact the media and offer a "new angle" on the story, one that everyone missed and the public will find interesting. News organizations will keep writing about a subject as long as the public is interested, and skepticism offers a perfect "second day lede." We can also expand and localize the story. When the Iraq government bought dowsing rods as bomb detectors, the media would have been very interested in learning about school that bought dowsing rods as drug detectors. Balance is a tricky subject for skeptics. We see cranks in the news to balance real science, such as stories on the Large Hadron Collider stories that featured Walter L. Wagner to dredge up fears that it would create a black hole. But we also see a lack of balance in stories on alternative medicine, where even a single quote from a "token skeptic" would be appreciated. With balance in mind, we need to ask ourselves what the best mainstream media news stories would look like for skeptics. Because of skepticism reactionary nature, it would have to include both skeptical sources and woo sources. We can't knock down logical fallacies and myths until someone sets them up. As skeptics, we're used to seeing woo go unchallenged in the media. However, in a fair and properly refereed fight, we win. The facts are on our side and we've learned what tricks the enemies of reason use. In a perfect world, the media would be contacting us, but it's not a perfect world. It's up to us to put real effort into reaching the media so we can get our message to the public. "How do you respond to the leftist argument that free-markets enable undesirable behavior by industries such as "predatory lending" or the neglect of ecological disasters such as the Union Carbide leak in Bhopal. Sales of bottled water didn't skyrocket until massive marketing campaigns (propaganda?) convinced people that bottled water was a good idea - despite being wasteful and relatively quite expensive. "Credit cards are another example. I would argue credit cards are a significantly better idea than bottled water - and certainly have their uses. But obviously, some people just shouldn't have them. Credit card debt can be devastating. If they were logical and well informed, I assume they wouldn't demand the service - or maybe demand less, but there are obviously instances of people borrowing more than they can handle. "People who fail to pay their bill on time and suffer late fees are profitable. In a free-market, what's to stop a credit card company from spending millions on targeting their marketing towards profitable consumers in the absence of education (generally public) or consumer protection mechanisms? "Individualism and self-reliance (qualities highly valued by the right) are great, but what's an individual to do when millions (billions?) of dollars are spent to convince them to act a certain way that benefits industry but, arguable, is destructive to them. (Think: consuming expensive bottled water, eating fast food and accumulating excessive debt.)" In answer to your first question, I believe competition in the free market protects most consumers from bad products. The Internet has been a great tool for assembling consumer reviews, including repeating horror stories of bad companies. Milton Friedman did a PBS special in his 1980 Free to Choose series entitled "Who Protects the Consumer?" that goes deeper into how the free market encourages good products and services, and how government intervention stifles these things and creates monopolies. You can see it here. It's important to remember that even though there are flaws in the marketplace, the treatment from government intervention has a lot more potential to do harm. Bruce Yandle came up with a theory called "Bootleggers and Baptists" that any piece of legislation will have two types of supporters: Those who support it on moral grounds (The Baptists) and those who support it because they will benefit from it (The Bootleggers). He explains how the Clean Air Act was worsened by coal lobbyists. The legislation forced companies to buy an air-cleaning product that made it cheaper to buy the most toxic coal around, and it lead to more pollution. In addition, Yandle identifies the tobacco settlement in the 1990s as a scheme to make it more expensive to sell tobacco; protecting big tobacco from smaller competitors. If you take one thing away from this response, let it be this: Corporation do not want a free market. Big companies would much rather have the government protect them from competition. They are willing to lobby or make outrageous claims in support of regulations, tariffs, subsidies and bailouts for protection. "No matter how well crafted advertising may be, the inescapable fact is that the market always has a choice. The most skillful advertiser cannot foist a product on a public that doesn’t want it. There’s a reason for the failure of products like Bic disposable underwear, Cosmopolitan (magazine) yogurt, Colgate kitchen entrees, Ben-Gay aspirin, Smith & Wesson mountain bikes, and McDonald’s clothing. Though respected, experienced advertising agencies threw their best at these products, the market voted NO with its collective checkbook, leaving ad agencies powerless to do anything about it. "But markets can and often do wield the checkbook irrationally. When that happens, advertising makes a handy scapegoat. Advertising couldn’t make us buy Coors bottled water or Harley-Davidson perfume, but people still prefer to believe it makes us reach for Apple Jacks instead of apples." So while I agree that buying bottled water is foolish, I don't know what impact advertising had on it's success. As Cuno writes, it's a logical fallacy to assume that because sales increased after an advertisement, that the advertisement caused the sale. Specifically, that fallacy is called "Post hoc ergo propter hoc." As for predatory lending - I really don't know much about this subject. It's possible that companies try to give people credit so they can be trapped in debt, but that just sounds like a campfire story about dark masters. What I do know a little about is the allegations of predatory lending and the recession. We blame companies for giving houses to people who can't afford them. However, that doesn't mean it was the free market at fault. We had a big push to help people get houses, and we had a string of lawsuits against financial institutions that didn't lend to the poor. What are banks supposed to do? We said its wrong when they only lend to the rich, but then when they lend to poor people and those loans default, we say they were acting irresponsibly. Mike Munger of Duke University said regulations set the banks up for the fall. There's still plenty of blame to go around to the banks, but it wasn't simply a lack of regulation that caused the terrible problems. The free market, however, does not guarantee environmental protection. That's why I support pollution taxes. It's very easy for a company to tolerate pollution "externalities" and a tax on pollution makes companies absorb those costs. In addition, I also believe the government has a role in punishing companies that commit fraud. They aren't doing a good job of it with pseudomedicine, as the FDA allows companies to sell placebo products if they just put a little message on it that says it hasn't been tested. In both of these cases, someone could make an argument that the free market will solve them. Fraudulent businesses will get bad publicity and people will avoid them, and there's a big push for environmentally-friendly companies. Consumers can encourage a company to be more Earth-friendly by boycotting reckless ones. However, I don't believe these forces are enough. Fraud is a very purposeful act and deserves legal punishment, and people don't shop around enough for things like utility companies - which can lead to a lot of avoidable pollution. We've all heard people on the left claim that America should be more like the Scandinavian countries, with high tax rates, little inequality and as a supposed result, a high standard of living. Sometimes Scandinavian countries are used as positive examples of socialism. But Scandinavian countries - Denmark, Finland, Iceland and Norway and Sweden - aren't socialist. Don't take my word for it, look at what else the socialists say. "...was about as remote from socialism as imaginable. The core notion of, atleast traditional socialism is that working people have to be in control of production and communities have to be in control of their own lives." This sounds a little like the No True Scotsman fallacy and a lot like the Moving Goalpost. Socialist intellectuals, the kind that volunteered to fight in the Spanish Civil War, fawned over the Soviet Union. George Orwell was a notable exception - a socialist who was critical the communist regimes of his day - and Christopher Hitchens argues that Orwell's condemnation of Stalin and other socialist experiments earned him the hatred of sincere socialist groups. "Most of the speculation about the superiority of the communist system including the popular view that Western economics could painlessly accelerate their own growth by borrowing some aspects of that system - was off base. Rapid Soviet economic growth was based entirely on one attribute: the willingness to save, to sacrifice current consumption for the sake of future production. The communist example offered no hint of a free lunch." While investing all resources into capital investments and neglecting day-to-day spending works at first, Krugman said this system can not continue to last long. You could make a five-foot high column out of pressed beach sand, and you may find a way to build faster than a stone mason or a carpenter at first, but you will not be able to build indefinitely high. You will have the same end result that the Soviet Union and the "Asian Miracles" experienced. 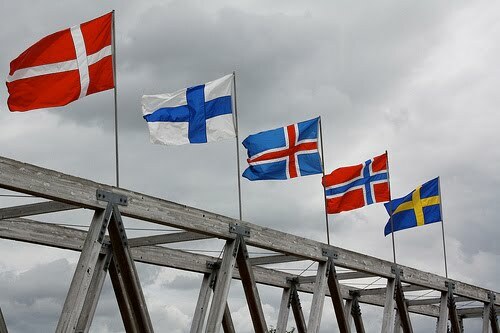 But back to the chilly nations with cross-motif flags. Socialists are taking back what they said about the wonders of Russia and are now disqualifying the USSR because the state owned all of the businesses - not the people. I suppose there must be a big battle between these new socialists and progressives who defend government encroachment by trumpeting "the government is us, the people!" "Between 1980 and 2005 only New Zealand moved toward free markets more rapidly than Denmark. My interpretation is as follows. Free market reforms threaten to erode rents earned by various special interest groups. Thus after 1980 these reforms were more likely to occur in countries where the civic culture is more oriented toward the common good. (In other words if you hear that culture is “tribal,” or that “family comes first,” it’s economy is likely to have statist economic policies.)" Sumber suggests the ability for a nation to have a welfare state without becoming a nation of lazy playboys, and eventually running out of money, rests on its culture. If the culture promotes hard work and discourages collecting government handouts, it can survive. He cites a study on civic virtue that shows Danes are one of the least likely people to say they'd accept government benefits they are not entitled too. I add to that that the Scandinavian countries have ghastly limits on immigration simply to keep people from showing up to collect public assistance. This protects the welfare state from filling up with moochers, but it keeps out sincere immigrants who want to work and benefiting the economy. Members of the right who wish to call Obama's welfare state policies "socialist" may wish to calm down their rhetoric. Someone with that definition of socialism would be forced to include the Scandinavian countries, and that would imply that socialism works. How free are Scandinavian economics? Denmark leads the world in the Forbes magazine business climate ranking. The top ten are Denmark, Ireland, Finland, the United States, the United Kingdom, Sweden, Canada, Singapore, Hong Kong and Estonia. The Heritage Foundation has a similar ranking for economic freedom. Denmark comes in 9th, Finland 17th, Iceland 18th, Sweden 21st and Norway 37th out of 179 countries. The Economic Freedom Network placed Denmark in 12th, Finland 16th, Iceland and Norway tied for 24th and Sweden came in 40th out of 141 countries. Now let's compare that to the Corruption Perceptions Index, where countries are ranked on how little entrusted power is used for private gains. Denmark came in 2nd, Sweden 3rd, Finland 6th, Iceland 8th and Norway in 11th. Other chart-toppers on the corruption index include New Zealand, Singapore, Canada, Hong Kong and the United States - all of them were top scorers on the economic freedom rankings. It's clear that there is a strong correlation to free markets - where the government has little control over the business world and a lack of politicians and bureaucrats using their position for financial gain. It could be simply because they don't have enough power to abuse. It's very foolish for a company to bribe a bureaucrat if that bureaucrat can't do anything to help them. The key to Scandinavian prosperity is free markets. It is not the child of a generous welfare state. Instead, free markets are able to provide a lot of wealth in culture of people who don't seek government as a source of wealth, and that's why the government is able to run a generous welfare state. Time will tell if that welfare state will corrupt the Scandinavian culture. For now, what works in Scandinavia must be seen as a packaged deal. While they did lower their tax rates in the last few decades, they are still much higher than ours. It would be a mistake to assume our prosperity would go unpunished if we introduced higher tax rates without increasing economic freedom, magically eliminating the sense of entitlement from our culture, making standard of living compromises and imposing strict immigration limits.